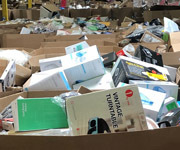 Amazon.com is a huge online marketplace and there are hundreds of liquidation loads available from the company. A long-standing issue with these loads involves the overstatement of retail values on manifested loads. It is not uncommon to see retail values assigned to items on Amazon.com manifest being two or three times what the item is currently selling for on their website. You can easily pay 50% and more of retail for some of the products and it's hard to make money at that point. This is been a long time problem with manifested Amazon.com loads. Some of the facilities that process Amazon.com loads do this by category rather than by manifesting each item. Pricing these loads is a guess since total retail value is not known. Is the only real opportunity to get more than you pay for with Amazon product and not be subject to overcharging due to overstating retail values. Amazon loads usually require being on a waiting list. The wait times are relatively short. These truckloads are 26 tall pallets. Most trucks are very full. There are plenty of large items which is good for retail stores. Average wait time 7 to 21 days. Call for pricing. 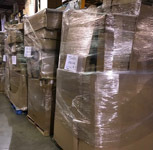 These truckloads are 26 Gaylord pallets with high piece counts. The pallets contain a high average piece count. The overall condition of these loads is usually very good. It is common to see items like Yeti mugs and Ray-Ban sunglasses among many other items. These are excellent loads for stores, especially bin stores. This is the highest value Amazon.com load in our opinion. The most bang for the buck. Lots of overstock and lots of retail value in the truck. Amazon small loads have been pulled off the market due to several factors including online sellers linking their listings on products on these loads to current Amazon listings. The K Mart MOS/Store Closing Loads are the only loads we know of with piece counts and values that compare to the Amazon small loads. These truckloads are 26 pallets. The piece counts are not as high as the moderate retail loads and the product is not quite as clean but still good. Lots of strong retail items which makes them the most popular with online sellers. This is probably one of the best clothing values on the market. Truckloads are 26 pallets. Pallets average 800 to 1200 pieces. Most of the items are poly bagged and in excellent condition. Nice selection of everything from designer clothing to very basic clothing. Infants and children's clothing are usually included in the loads as well as men's and women's. These are excellent loads for export as well as domestic use. Average wait time 7 to 14 days. Call for pricing.